Home / News / Subscribe to the Regal Robot Youtube Channel! Subscribe to the Regal Robot Youtube Channel! We’ve posted a number of videos here on our news and blog pages, but did you know we’ve got a Youtube channel as well? 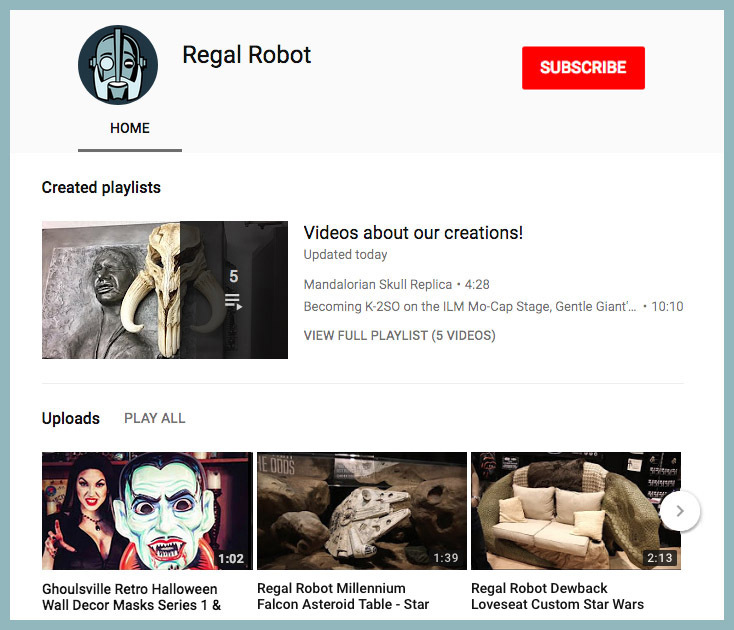 We’d greatly appreciate if our friends and fans took a moment to subscribe to the Regal Robot Youtube channel today! On the channel, you’ll find our video uploads featuring products we create and carry, as well as a great series of interviews and product features made by the Star Wars online team at Star Wars Celebration in 2017. In addition to our uploaded videos, you’ll also find a playlist featuring videos from fans, Tested.com and even The Star Wars Show featuring product reviews and features with our creative team! So be sure to visit our Youtube channel today and we do hope that when you do, you’ll consider subscribing! Thanks for giving this a look and happy new year to all of our friends and fans! Subscribe today and get videos about our products and interviews with our creative team!